I’m currently almost finished rereading Six Of Crows by Leigh Bardugo, and of course I’m loving this story as much as I did the first time around. As soon as I do end the final page, I’m picking up the sequel Crooked Kingdom! 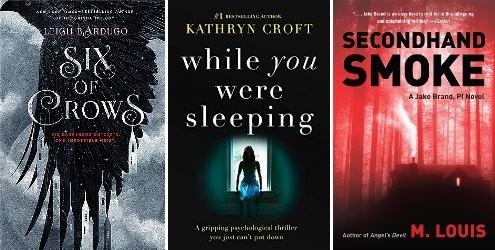 I’m also reading the Netgalley ARC While You Were Sleeping by Kathryn Croft, although I’m only a few pages into that one so far. And I’m quite far into my very first audiobook experience with Secondhand Smoke by M. Louis. I have to admit it takes some time getting used to the whole audiobook thing, but this action-packed story does make it a lot easier for me to enjoy the process. * I first finished reading Furthermore by Tahereh Mafi, which I had picked up on a whim after being in the mood for a fantasy read. (The fact that it’s a Goodreads Choice Nominee is a bonus of course). I loved the worldbuilding and the prose is great, but I wasn’t too convinced by the characters or the ending. It’s a middle grade read though, and I have a feeling the target group will probably love this story. * I then finished reading The Girls Next Door by Mel Sherratt, which turned out to be quite a refreshing new detective series in the way that the detective the series is named after doesn’t play that big of a role nor does she have a messed up private life. It’s also quite a fast-paced read, although I have to admit the sheer amount of characters that is introduced can get quite confusing at times. I had a hard time identifying where each character stood in the story, and it made it more difficult to actually just enjoy the story. I also had problems with the credibility? * Afterwards I decided to read When Breath Becomes Air by Paul Kalanithi, and it turns out it is nominated for Best Memoir for a good reason. This memoir is powerful, raw, emotional and simply heartbreaking… The story of a young neurosurgeon who lost the battle against cancer, a man who tried to write down the story of his life during a race against the clock. The rush especially shows in the last part he wrote himself, but that only makes this memoir more authentic. The final part written by his wife was especially moving. * Afterwards I decided to continue with Homegoing by Yaa Gyasi. It’s a truly interesting historical fiction novel set in both Africa and the US and follows different generations of two initial characters. The story was a bit confusing in the beginning, mostly due to the sheer amount of characters that are introduced over time. The pace was a tad slow at times as well, but overall Homegoing is without doubt a very powerful and well researched historical fiction novel. This entry was posted in Book Memes, WWW Wednesdays and tagged a man called ove, book memes, crooked kingdom, fredrik backman, furthermore, homegoing, jeff zentner, kathryn croft, leigh bardugo, lilac girls, little women, louisa may alcott, m. louis, martha hall kelly, mel sherratt, paul kalanithi, secondhand smoke, six of crows, tahereh mafi, the girls next door, the serpent king, tipping point, tomas byrne, when breath becomes air, while you were sleeping, www wednesdays, yaa gyasi by Yvo. Bookmark the permalink. I’m glad I wasn’t the only one that thought Ove sounded like Carl from the movie Up! I totally want to rewatch that movie now. And I agree there aren’t many books out there that can manage to make me laugh and cry at the same time. A whole bunch of these books are on my neverending TBR list! I’m hoping I’ll get around to them soon!! I recently bought The Serpent King because I keep hearing awesome things about it. I hope it’s good!! Fingers crossed it is! I’ve been hearing great things about it as well. Sounds like you’ve come across some really good reads. I’m definitely adding Ove to my must read soon list as it sounds fantastic. I can’t actually remember whether I’ve read Little Women or not but I hope you enjoy. Wow! That’s a lot of good books you’ve read! I really need to get started on the Six of Crows series! Six Of Crows is SO good! I’m keeping my fingers crossed the sequel will be just as good, although most people that have already read it seem to love it. I still have to read his other novel, but A Man Called Ove is SOOOO good! And yes, this book is worth that many ‘o’s. 😉 And if Crooked Kingdom is anywhere near as good as the first book, you will have a great time reading it. It’s without doubt one of my all time favorite YA fantasy series so far. I’m devastated, I won’t have time to read Six of Crows before 2017! 😂 While You Were Sleeping has a very interesting blurb, I can’t wait to read your thoughts on it. I was recommended The Serpent King. I thought it was a weird scifi or fantasy so I was nicely surprised to learn I was mistaken! Happy reading! Ohh that’s too bad!! But I guess the good part is that you will have something really good to look forward to in 2017. 😉 And I’m actually still not too sure what’s The Serpent King is about haha, but I like surprises every once in a while (I read the blurb when I first got the copy, but I have completely forgotten what it’s about since). Happy reading! I agree, the cover is gorgeous! I loved the worldbuilding in Furthermore; it’s so creative… Definitely makes me want to cross my fingers she will write another story in this world, this time a little more ‘grown up’ with more magic and action/adventures. I love her stories! She’s a definitely an auto buy author for me! I also just finished the audiobook of A Man Called Ove and yes, it’s BRILLIANT! Love love love Ove, grumpiness and all! 😀 And maybe I’ll get to Six of Crows next week! I’ve never read Little Women either! I’m glad I’m not alone. I feel like it’s one you’re suppose to read with your mom but it never happened. Happy reading and thanks for participating in WWW Wednesday! Good to hear I’m not the only one who never actually read Little Women… It does seem like a great classic to read when younger. Happy reading and thanks for hosting! Little Women is the perfect book to read around Christmas. Enjoy! That’s great news! I will definitely read it next month then.